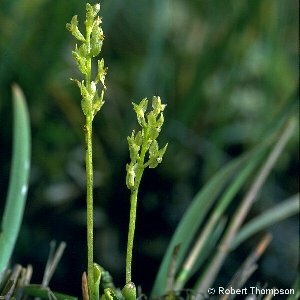 Bog Orchid (Hammarbya paludosa) is a very small plant of acid peaty wet ground, usually accompanied by sphagnum moss, with tiny yellow-green flowers. The flowers are upside-down compared to most orchids, because the flower stalk twists through 360 degrees (in most orchids they twist through 180 degrees). Consequently the lip, which is broad and blunt, is at the top of the flower. The basal parts consist of a so-called pseudobulb ("false bulb") which is a swelling of the stem, covered by the bases of the leaves. There are no roots to speak of, only hairs which are infected with a mycorrhizal fungus by which the plant obtains much of its food from the surrounding soil. The leaves are oval and produce abundant bud-like structures at their tips which drop off and are a means of dispersal of the plant in addition to the production of normal seed. 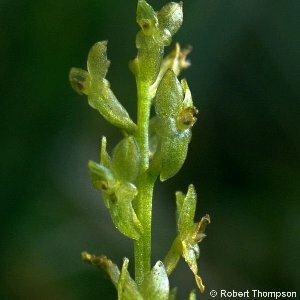 The bog orchid is one of the most difficult orchid species to find, partly because of its rarity, partly because it is so tiny and inconspicuous and partly because it flowers very erratically.